What rod is your "Go to" Rod? After purchasing several rods, I never thought I would have a "go to" rod. I have resisted this notion, but now realize I do have a "go to" rod. I guess it is O.K. To me a "go to" rod isn't the same as answering the question, if I could only have one rod, which one would it be? The answer to that question for me would be the Kyogi 18. I suspect that that will change when I get my special order Kyogi 15. The Kyogi is a "do everything" rod. What I mean by a "go to rod" is the one that you most want to fish with if the conditions are right. I sort of had a "go to" rod with the Suntech GM Suikei Keiryu Special 44. It is an awesome rod. I loved the three lengths, 360, 400, and 440. However, it doesn't handle the wind of Idaho like I wanted it to, so I ended up buying a Suntech Genryu Sawanobori 45. This is an awesome rod for the wind. Among my rods, this is the best Czech Nymphing rod. I have also been doing spoon fishing with it too! So, as much as the Keiryu Secial 44 was "my go" to rod, it like I suspect all zoom rods, had compromises. Early this summer and into mid summer, my youngest son has rekindled his interest in fishing. On our 3rd trip into the mountains, he got his hands on the Suntech GM Suikei Keiryu Special 44, and wouldn't let go! The last thing I wanted to do was discourage him, so I gave him the rod. That said, I had a plan! My son likes things simple. My favorite mountain stream is ideal for a 400 cm rod, so I bought a TenkaraBum 40. Once it arrived, I told John we needed to head back up to my favorite stream. My plan was after a couple of hours, casually suggesting that we switch rods. I figured he would like the TenkaraBum 40 because it was a more simple rod, and it had a handle. The first fish I caught up there on the TenkaraBum 40 was a nice 15 inch Cutthroat. The stream we were fishing is fly fishing only. It nailed the Keeper Kebari, and I couldn't believe what a fun fight it was. The bend profile of the TenkaraBum 40 is amazingly smooth and powerful! About an hour into my fishing session, I began to realize how accurate I was able to cast with this rod! At this time, I was sight fishing to a couple of nice 12 inch Brookies. I dropped the Keeper Kebari in just the right spot, and wham!, fish on. It was a "Many" fish day for both of us. In the mid-afternoon, the winds came up. I looked over at John, and he was struggling a little with the Keiryu Special to put the fly where he wanted it. I noticed that with the TenkaraBum 40, I wasn't having that issue! I was hooked on this rod! I never did switch rods with my son. On the drive home, I decided that I need to test the TenkaraBum 40 on sunfish. 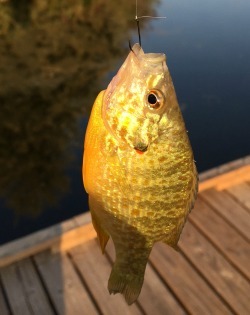 I headed down to my favorite pond, and totally enjoyed catching 3-7 inch bluegill and pumkinseed sunfish. Awesome! It wasn't as fun as with the Suntech Kurenai HM30R, but I didn't have to worry if a 3 pound bass nailed my fly or red wiggler. So, then I was off to the Boise River where I fish the transition between warm water fish and trout. After catching three brown trout (12-14 inches), and two nice 17 inch smallmouth bass, I was grinning ear to ear! I never thought I would have a "go to" rod. I thought that fixed line fishing was always going to demand a unique rod for each situation. With the TenkaraBum 40, I discovered that this rod has been engineered to navigation the narrow window of versatility without compromise that I didn't think existed. When I go fishing, this rod is always with me. My first thought is, "Can I fish this area with the TenkaraBum 40." It doesn't always work. Three weeks ago, I was at Wilson Creek. I began with the TenkaraBum 40, and caught several fish. I spotted a very nice 17 inch rainbow down in the brush. After 4 attempts to get my fly down in there, and leaving two of them in the trees, I collapsed the TenkaraBum 40, and pulled the Diawa Kiyose SF 30 tucked in my bag. It was "Fish ON" on the first cast, and the battle was epic, and I needed the shorter rod. My view of the TenkaraBum 40 is that it isn't a compromise rod, by a very carefully engineered rod that gives you maximum versatility. I love this rod! My next rod, will be the TenkaraBum 33. Chris has designed an awesome winning series of rods with the TenkaraBum 33, 36 and 40. They are a bargain at the price point too! I was going to fool my son into a trade, instead, I discovered a real "go to" rod for me. I believe that I am just scratching the surface of the potential of this rod. What is your "go to" rod? Comments for What rod is your "Go to" Rod? If I Could Have Only One Rod . . . If I could have only one tenkara-style rod . . . I would be a very sad angler! Okay, I guess it would be my Suntech Keiryu Special 39 (TenkaraBum Traveler now) because of its versatility and quality construction. Now, having said that, I have to tell you a few others . . .
My "one-smoothest-casting-rod"--the Tenryu Furaibo TF39. My "one-best-micro-rod"--the Nissin Air Stage Hakubai 240. My "one-best-small-fish-rod-I'd hate-to-be-without"--the Suntech Kurenai 30. My "one-best-small-stream-rod-that-will-still-handle-pretty-big-fish--the Suntech Keiryu Special 27. John, I knew someone was going to answer like you did! So, mark one for the Suntech TenkaraBum Traveler 39! I just never thought I would be impressed with one rod so much as the TenkaraBum 40. To be totally candid, I was ambivalent when it arrived. I never had that feeling about a rod before. I bought the rod based on my son's likes and dislikes. I knew he would love this rod. I was planning on only owning it for about two hours of fishing. My initial plan was to fish it for a couple of hours, and then get my "Traveler 44" back! In my wildest dreams I didn't think any rod could cast everything from size 28 dry flies to my double fly beadheaded nymph setup with ease. I have fished Kebari from size 18 - size 4. And of course it handles red wigglers and mummy worms without any effort at all. The biggest fish to date is an 18 inch trout and smallmouth bass. It has power to spare. The smallest is a 2.5 inch Sunfish. It is one of the smoothest casting and fish fighting rods I own. Maybe the question should be, "Which rod do you like to start fishing with if at all possible?" Would I give up any of my rods? NO. They all have their place in my fishing. I was trying to get my (new name) Suntech TenkaraBum Traveler 44 back from my son because I liked it so much. I was astonished by the TenkaraBum 40's performance and versatility. So we are now both happy. He hasn't asked to try the TB40, and I am not going to make the offer. I guess I can't name one go-to rod, but I'll spill the beans on three that, by checking in the fishing log, are the ones I've fished the most this year. Suntech AOI ZPRO 53: At 17'3" and 2.8 oz. this is my longest rod and extremely pleasant to fish. Being rated for 6X tippets it's best for open water with few weeds and snags, but under the right conditions it's very capable and fine for most of the fish I catch. It's a very good and accurate caster with #8 beadhead Buggers down to itty bitty wets and dries. Even little shiners are fun to catch and anything larger is a blast! Nissin Air Stage Hakubai 390: What I think of as the 13' little sister to the AOI ZPRO 53 only weighs a feather-light 1.4 oz. It's my one seiryu/ micro/smaller fish rod and more. Some days I feel like just going after shiners and chubs and this is the rod for them. Bluegills give it a real workout. Delightful! Suntech FMX Keiryu Stiff 45: I've reported on this rod in three installments and each time I've erupted with praise of how well it casts, handles various lines and is just a wonderful all-around rod. At an inch short of 15' and at 3 oz. it has "just right" length and weight for a geezer who's had shoulder problems and fishes for 3 or 4 hours at a stretch. Being rated for 5X tippets it has enough moxie to handle pretty nice bass, although in heavy weeds sometimes it's necessary to walk up the line and dig 'em out. I love this rod! As you gentlemen have observed fixed line fishing is a many rod game, each being chosen for a niche. It's hard to imagine (unthinkable to me) having only one rod for everything. The thing is to know your venues and more importantly, yourself. Where, how and for what we fish combined with personal preferences is, I think, the key to full enjoyment. And remember, you can't have enough fixed line rods; it's too much fun experimenting! I think I fish to many different sized streams to pick just one rod as my go to. I enjoy fishing long level lines at times on bigger water but if the wind comes up I'll throw a 4m PALs tapered line and sneak a little more. Like to fish a 5:5 rod one day and a 7:3 rod on another, whatever mood strikes me on a particular trip. As to what rod puts the biggest smile on my face when fishing its gonna be the Airstage Fujiryu 360 5:5, just an incredible piece of engineering. The Airstage will cast a 16ft 2.5LL in the wind or a PALs line, handle as big a fish as I'll likely ever catch and is as smooth and forgiving as a tenkara rod gets. Gotta agree with Chris on the Airstage, Hiromichi Fuji really knows how to design a tenkara rod, better than most in my opinion. And man do I love the feel of those aromatic cypress grips, puts a smile on my face just thinkin about it. Will the Airstage be my go to rod in most conditions, maybe not, is it my favorite rod to fish, yeah, I'd say it most certainly is! John Evans - Question! I know you have a Suntech Fieldmaster 39 in your collection as well. Stolen by your wife, similar to my experience with my son! You wrote about your wife stealing it! You didn't mention it, but you did mention the "Traveler 39" that you like to use. Could you comment on a comparison of the two? As much as I do have a "go to" rod, I am always looking (drooling) at some of the other offerings. This is an addiction! Since my son caught his housemate using his rod, he has been keeping it at the house. He is getting it back tomorrow because he put a new lock on his room. I am hoping to get out today and do a comparision of the TenkaraBum 40 and the "TenkaraBum 44" set at 40. The rod I use the most would be the TBum 36. It's just a great all around rod for panfish, trout and bass. Lately, however, I've been really giving the Kiyogi 21 a workout. It's proven itself a very capable catfishing and carping rod, and has the power and 0X tippet rating to drag good-sized bass out of the "salad" where before I'd lose them due to tippets breaking (including the Flying Dragon and 3X). So far the biggest fish I've caught with it have been a 12.5 lb koi and a 10 lb channel cat, but it handled them so well I feel it's capable of a lot more. With water temperatures dropping, I plan on trying it out against wipers as they put the fall feedbags on. Wipers put up a spectacular fight on spinning or baitcasting gear, so I'm excited to have a fixed-line battle with one! That's a good question, about comparing the Field Master and the Suntech Keiryu Special 39 (now Traveler). Both of these are excellent rods and cosmetically very similar. The Field Master, however, is a stiffer rod, with a more flared handle shape. It is my wife's favorite rod--but she often fishes nightcrawlers on a beadhead hook. It excels in fishing deeper holes, for catfish and bass in our part of the world. She caught both bass and catfish on it this past week at Guadalupe River State Park. I'm pretty sure she will no longer let me use it . . . The Keiryu Speical has a somewhat narrower handle and more flexible feel. It will also fish worms effectively (as the name suggests) but casts lighter lines and flies better. One more comparison: For whatever reason, the Field Master casts much better at the 360 length than the 390. (Several people have commented on this.) The Keiryu Special casts about equally well at 360 and 390. The "TenkaraBum Traveler 44" fishes very well at 360 and 400. When you zoom to full length, 440, you really feel the rotational effect of a longer rod. That is just physics. The last two times out, I have been fishing the Suntech Genryu Sawanobori 45. The weight difference between the Suntech Genryu Sawanobori 45 and the TenkaraBum 40 is .2 ounces. The rotational force of the extra half meter of length isn't linear. I'm not complaining. It is just the way it is. I have been fishing the Suntech Genryu Sawanobori 45 the last two times out because we are entering "nymphing season" here in Idaho. This is an amazing rod for going deep with a two fly nymph setup. It is stiff enough to feel the ticks on the bottom, but flexible enough to cast well, and have an enjoyable fight with trout as small as 6 inches. Just to clarify this thread, I would love to hear from more folks what their "go to" (favorite, one they love to fish the most, most versatile) rod is. In the wind yesterday, the Suntech Genryu Sawanobori 45 was a god send! It was much more pleasurable to fish than the TenkaraBum 40, and more effective detecting the strikes! The wind negated the attributes of the TenkaraBum 40 that draws me to it to want to fish it first! By the way, the TenkaraBum 40 fishes a double nymph setup well too when it isn't blowing! The spoon comment caught my eye. How heavy a spoon were you using? I assume something like the Vega but not something as heavy as the Crusader? That reminds me - the Vega spoons, which I have in .8 gram weights on the Finesse-Fishing.com website also come in a .4 gram version. I confess to having caught fish using a .8g Vega spoon with a Tenkara Traveler 39. It was a bit heavy - kind of like casting a conehead bugger with a fly rod - possible but not pretty. I have been fishing with the Daiwa Crusader 2.5g spoons. They work O.K. with the TenkaraBum 40, however with the Suntech Genryu Sawanobori 45 they really shine! The extra length and stiffness really give the ability to cast and manipulate the spoon. I would write up a report, but I am still exploring. Just like all fixed line fishing it seems like the trout or bass really slam the spoon (bait). Mostly I have been using spoons to fish seams in the creeks and rivers that I know pretty well. About 75% of the time, you can actually see the trout slam the spoon! There is a chute that I love to fish. Often I get a take when I just let the spoon drift down the chute. Working the spoon back up the sides of the chute results in a pretty dramatic take! 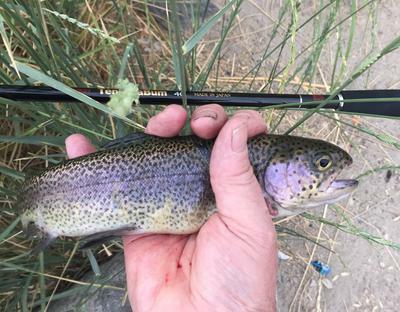 The most fun I have had so far with a spoon is with a 17 inch rainbow. I drifted a Red Wiggler by his lair a half dozen times and he wouldn't move. I then drifted three different Mummy Worms by him, and he still wouldn't move. I then cast a gold 2.5 gr. Crusader 4 feet upstream and about 4 feet beyond him and retrieved it about 18 inches in front of him. He didn't move when it went by his nose, but as soon as it was about 3 inches by, he turned and slammed it! My intuition tells me that a rod that can handle 4x tippet will make a great spoon rod. I am planning on trying the Kyogi 18 next time I go out. If I were going to buy a rod for spoon fishing, I think a 5.4 meter would be ideal. I may be wrong, so I am going to try my 5.4 meter rod next time. Maybe 4.5 meter is the ideal. Lots of great exploring with this type of fishing! I fished spoons at the private bass pond I have access to with my 8 meter Fieldmaster. It worked great, but after 40 minutes of fishing my arms were dead! I caught six nice bass. I would look hard at the Suntech Field Master Suguru Long or the Suntech Genryu Sawanobori rods. The Kyogi might be ideal, but I have not tried it yet. Fishing flies, bait, and now spoons gives a lot of options! my skills may improve to be able to manipulate a spoon with it as well I can with the Suntech Genryu Sawanobori 45. I do like the extra length. Personally, I think the 2.5g spoons are way too heavy for a fixed line rod. Even the .8g Vega seems a little too heavy, which is why I mentioned the .4g variety, which are the same size but stamped from thinner metal. I've had nice sized fish take them (when fished with a spinning rod). As Les's account shows, it can be done. I just wouldn't do it myself. Besides, I'm getting to really like the UL spinning and baitcasting, so I will use either one of those methods for all but the smallest spoons. I have been enjoying exploring the edges of fixed line fishing. I finally came out of the closet on my use of Method Feeders in the Blog Post, "Finally, #koiquest2017 success!" Jeff D. caught his Koi with a Method Feeder! I am having fun! I am not a purist! I am exploring the edges, and having a blast! I do have a nice spinning rod setup, (saving for a premium one from Chris). It is much easier to fish spoons with a spinning rod. If you notice my last post, the spoon was the last resort on the 17 inch rainbow. I would have tried flies, but I had left my 3 fly boxes at home that day. My next crazy adventure that I am working on is going after Sturgeon with my Kyogi! Stay tuned. I've used the Crusader 2.5gm spoons and had good luck with UL spinning both creek and lake. Before Chris brought out the Vega I started making my own from #3 willow blades. Weigh about the same at .8gms. Seems like it's always too windy to give them a good workout though. My favorite by far is the Suntech GMR special I have the original model and the newer model. Overal when fish are running from 8 to 18 inches this is the rod I prefer for banging around with. It has served me well for quite a few years now. Very accurate and a really nice light tip but a fish whipping lower end grunt. So it's fun with small ones and handles big ones great. The Sagiri 39MC for smaller fish from 6 inches to 14 inches+ It was my first Tenkara (Seiryu) rod and still remains one of my favorites. A real bang for the buck. When I am headhunting the big boys on large water my Daiwa LT36,39 or 44SF carry the load and haul out the big boys. When I am carp hunting the Daiwa Sekkei Lantern rods are apparently capable of pulling out tree stumps. Other rods I really enjoy are out there but those are about my favorites.